Think your belongings will be protected during a tornado just because they’re locked up in a self-storage unit? Few buildings can withstand the 200 mph winds of an F4 tornado, but even lower-category tornado blasts can twist off roofs and blow your stuff around in pounding rain. So, how can you choose a self-storage facility that offers your possessions a fighting chance of surviving a tornado? Check out these tips. Choose self-storage buildings constructed with reinforced concrete and steel supports, said Mike Schofield, president and CEO of MiniCo Insurance Agency in Phoenix, a self-storage insurer. “The engineering, design and how well they are built are key elements,” he said. Shearing winds can peel off metal roofs “just like a sardine can,” said Amy Bach, executive director of United Policyholders, a national insurance consumer advocacy group based in San Francisco. Units with individual roofs (rather than one long sheet on the building) are more secure. Look for a roof that’s got tie-downs. Steer Clear of “Cheap” Storage. If you went with the cut-rate storage facility, the storage buildings may be flimsy or vulnerable, Bach said. “The better facilities in tornado alleys that have survived tornadoes … should do a good job of explaining how their units are tornado-safe,” she said. Underground storage at places like Citadel Caverns may be an option. If you want stored belongings to be completely twister-proof, store them at an underground facility. 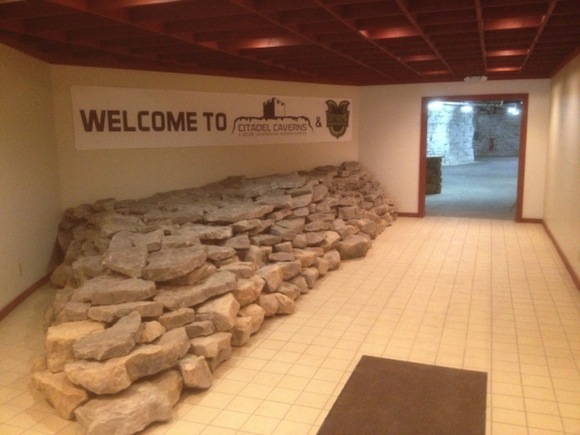 “When storms occur outside our facility, from the inside, you don’t even know it’s raining,” said Coby Cullins, owner ofCitadel Caverns, an underground storage facility in Atchison, KS. A storage facility’s property insurance doesn’t cover damage to your belongings. Your homeowner’s or renter’s policy may cover items in your self-storage unit, but make sure you check for exemptions that exclude off-site storage. You also can get self-storage insurance from many storage operators. “The last thing someone wants to do after a loss is sit down and create a super-long list of everything they’ve lost when trying to think about the future,” Bach said. Most insurance companies require an itemized list of damaged or destroyed items to process your claim after a tornado. This app from United Policyholders lets you maintain a home inventory. Check out United Policyholders’ UPHelp Home Inventory, a free app that lets you create a visual and written inventory of furnishings, jewelry, appliances and other items. “It’s photo-based, so you don’t have to write down stuff. Store the records in the cloud so you don’t have to worry about inventory records burning up or blowing away,” Bach said. Store Valuables Away From Home. One option for protecting jewelry, family heirlooms, old letters, photographs and similar items is renting a safe deposit box. Lock up anything that is irreplaceable, including sentimental baby items or an ancestor’s Civil War diary. Scan valuable documents and store them on a flash drive or in the “cloud” so you don’t have to sift through debris in your home to find your will, birth certificate, Social Security card and other documents. 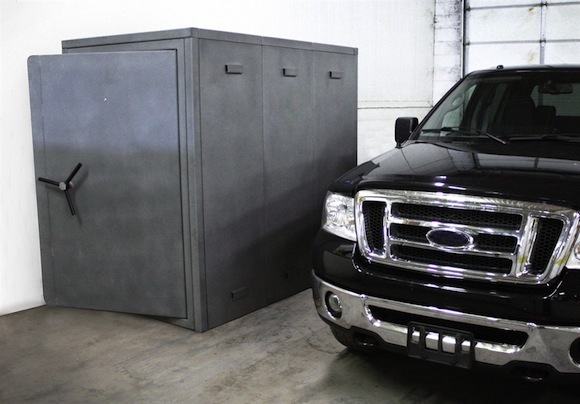 A vault-style storage room should stay put during a tornado. Install a Vault-Style Storage Room. Want a storage room that’s still standing when the rest of your house is in shambles? Look into getting a vault-style, or “secure,” room. The hardened-steel rooms sold by Big Texas Containers in Tyler, TX, were tested by firing 2x4s at 200 mph into the walls to simulate the battering of an F5 tornado, owner Jason Umbower said. These vault-style rooms can be installed in just about any area inside the house, even a closet. As long as the room is installed correctly, “there’s no reason it would go anywhere,” he said. Prepare a “Grab and Go” Box. Place baby pictures, photo albums, valuable papers—anything you don’t want to chase down amid wailing tornado sirens—in a container. Keep the box by your front door or in a hall closet, so it’s easily accessible. Another option is LifeinCase, a lightweight, portable tote that helps you organize important documents through a folder system divided into five categories: personal, medical, financial, estate and property. 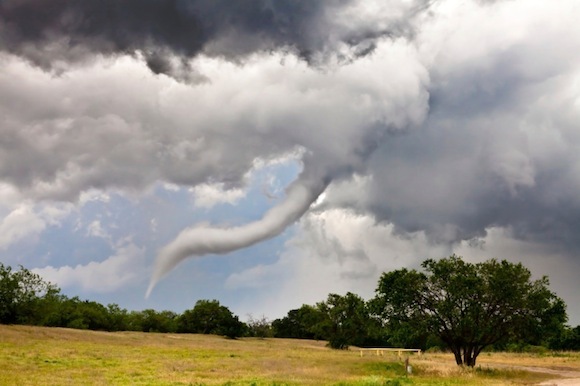 If a tornado warning is in effect, outdoor furniture, bicycles, tools and other objects that can transform into deadly projectiles fueled by high winds should be brought inside—but only if time allows.